We believe family matters in life…and in business. According to Forbes Magazine, nearly 90% of all US businesses are family owned or controlled by a family. They account for over 50% of the US Gross National Product. And they employ 62% of the nation’s workforce. They are a major force in the US economy. Family businesses offer a unique set of challenges due to the overlap of family, business, and ownership domains. Often these overlaps lead to conflict that interferes with keeping the business on track for financial success and continuity. 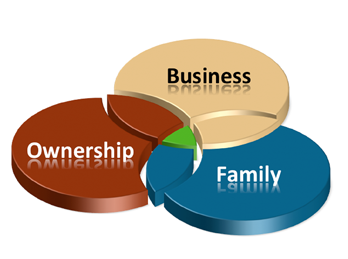 To better understand family business and its unique character in the business world, it is important to recognize the three different, but interrelated areas: the “family”, the “business”, and the “ownership” domains. Not everyone in the family is in each circle. This is where complexity – and often, conflict – enters into the family equation. Poorly designed leadership roles set up a family business for failure. Without it, the decisiveness and unity that a family business system needs for long-term performance does not exist. Good governance can bring stability and an enduring advantage to your family business. High performing family businesses have clarity around their core values, purpose and their vision for the future. They also have written rules and policies to guide behavior. And your last name does not guarantee you a position in the company. You have to earn it just like any other employee. With less than 33% of family businesses surviving transition from the first to second generation and less than 10% to the third, preparing the next generation of leadership and the ability to pass the baton are key components to success. One of the biggest factors contributing to successful growth and transition is the evolution of the parent-child relationship into an adult-adult relationship. Family businesses get stuck doing things the same way they have done for years, even when the business outgrows that structure. Proactively preparing the next generation of leadership, and planning for your own eventual departure is the only way to successfully grow and transition your business on your terms. Take this first step for everyone in the family to make the family business more successful.